"A sweet and salty mixture of crispy cereal with sugar and furikake seasoning makes this popular Hawaii snack a crowd-pleaser!" Melt the butter and sugar together in a small sauce pan over low heat. Remove from heat, then stir in the corn oil and corn syrup. Place the cereal on a large baking sheet. 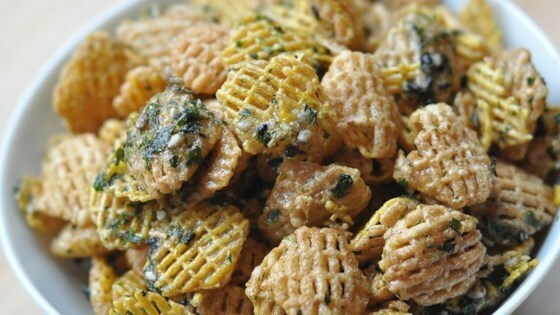 Pour the butter mixture over the cereal, then sprinkle the furikake while tossing the cereal to coat. Bake in the preheated oven until the cereal is dry, stirring every 15 minutes to keep cereal from browning too quickly. Allow to cool, then store in an airtight container. A yummy snack that is so easy to make and addictive!!! Add 2 Tbsp soy sauce to the butter mixture and nuts and/or arare to the cereal mixture. Soooo yummy! The receipe sauce is good for 1/2 batch. I made 2 - 17x12 deep pans with the receipe and just doubled the sauce. Added Mochi crunch. Easy to make and so yummy. It's always a hit at the office! I use white and brown sugar and substituted the corn syrup for light honey. I also added a little bit of soy sauce. I love this! It's hard to get local style snacks in the mainland and this just makes me happy.